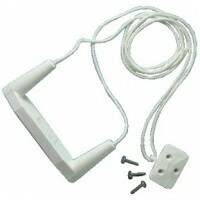 The Swim Stirrup® has been carefully engineered to provide safe, easy access to small boats for swim..
Dock ladder 3 step c/w hardw Finish: White GalvalumeDescription: LadderSteps: 3.. Durable and attractive, these ladders feature a hinged design which allows the ladder to flip up and..
Dock ladder 4 step w/hardware Finish: White GalvalumeDescription: LadderSteps: 4..
Dock ladder 5 step w/hardware Finish: White GalvalumeDescription: LadderSteps: 5.. These durable ladders are ideal for sure-footed access to and from the water or boat with a load cap..
Roto ladder 4-step Color: GreySteps: 4..
2 step transom ladder Size: 15" L x 15" H x 12" WSteps: 2..
3 stp tel ss over platform ldr Size: 34" L x 13.5" WDescription: Mounts on platform with 7" standard..
3 step tele ss spt/div lad Size: 34" L x 13.5" WDescription: Stainless Quick Release Transom Mountin..